Broccoli: A Closer Look — Imperial Valley Vegetable Growers Assoc. In the very half Italian Pricola household, the foreigner (that is me) is frequently confused about the three vegetables that are part of the staples we eat frequently. Those three vegetables look somewhat alike. Broccoli is certainly a favorite for both of us; broccolini and rapini are also part of our vegetable routine. In this article, I will try to explain the differences of these vegetables, which are all part of the cabbage family. Broccoli is an edible green plant with large flowering heads eaten as a vegetable. The word broccoli comes from the Italian plural of broccoli, which means "the flowering crest of a cabbage,” and is the diminutive form of brocco, meaning "small nail" or "sprout.” Broccoli is often boiled or steamed but may be eaten raw. Broccoli is classified in the Italic cultivar group of the species Brassica oleracea. Broccoli has large flower heads, usually green in color, arranged in a tree-like structure branching out from a thick, edible stalk. In our household, broccoli is lovingly called “trees.” The mass of flower heads is surrounded by leaves. Broccoli resembles cauliflower, which is a different cultivar group of the same species. I know--too much science. Broccoli resulted from breeding of cultivated Brassica crops in the northern Mediterranean starting in about the 6th century BC. Since the time of the Roman Empire, broccoli has been commonly consumed among Italians. Combined in 2016, China and India produced 73 percent of the world's broccoli and cauliflower crops. In Imperial Valley, in 2017, we produced 6,094,475 cases of broccoli valued at $94,806,000. That was a decline in units here, primarily due the cost of harvesting. There are three commonly grown types of broccoli. The most familiar is Calabrese broccoli, often referred to simply as "broccoli", named after Calabria, Italy. It has large green heads and thick stalks. It is a cool season annual crop. Sprouting broccoli has a larger number of heads with many thin stalks. Purple cauliflower is a type of broccoli grown in Europe and North America. It has a head shaped like cauliflower, but consisting of tiny flower buds. It sometimes, but not always, has a purple cast to the tips of the flower buds. Broccoli does poorly in hot summer weather. Broccoli grows best when exposed to an average daily temperature between 64 and 73 F. When the cluster of flowers, also referred to as a "head" of broccoli, appear in the center of the plant, the cluster is green. Garden pruners or shears are used to cut the head about an inch from the tip. Broccoli should be harvested before the flowers on the head bloom bright yellow. A 100-gram serving of raw broccoli provides 34 kcal and is an excellent source (20 percent or higher of the Daily Value, DV) of vitamin C and vitamin K. Raw broccoli also contains moderate amounts (10–19 percent DV) of several B vitamins and the dietary mineral manganese, whereas other essential nutrients are in low content. Broccoli has low content of carbohydrates, protein, fat, and dietary fiber. Broccoli also contains the carotenoid compounds lutein and zeaxanthin in amounts about six times lower than in kale. Boiling broccoli reduces the levels of sulforaphane, with losses of 20–30 percent after five minutes, 40–50 percent after ten minutes, and 77 percent after thirty minutes. However, other preparation methods, such as steaming, microwaving, and stir frying had no significant effect on the compounds. We stir fry it with garlic (remember, Italians use garlic a lot). While it may seem like a piece of undersized broccoli, Broccolini is actually a natural hybrid between broccoli and gai lan (Chinese kale). It is not the same as other "baby broccolis" that are hitting the market. The taste is sweeter and more subtle than the other hybrids. Broccolini is packed with vitamins, 100 percent edible and has a sweet, peppery taste that is creating a buzz in kitchens across the country. It's all part of the inventiveness and creativity of one California company. Broccolini was originally developed over eight-years by the Sakata Seed Company of Yokohama, Japan". It was developed as a natural hybrid rather than being genetically modified. Sakata partnered with Sanbon Incorporated in 1994 to begin growing commercially in Mexico under the title Asparation, chosen for undertones of asparagus flavoring. Sanborn Incorporated is based right here in Imperial Valley and managed by Bruce Sanbonmatsu, a long-time board member of Imperial Valley Vegetable Growers. After becoming first available in U.S. markets in 1996, in 1998 Sakata began a partnership with the Mann Packing Company and marketed the product as Broccollini. Sanbon, Inc. continues to grow Asparation in Mexico and we can find it here most of the year. Broccolini takes 50–60 days to grow after being transplanted. It is harvested when the heads are fully developed but are not flowering. By cutting off the head, the harvest time is extended by four weeks as new shoots of smaller heads now grow. After being harvested, the plant is cooled to 32 F, preventing the flower heads developing. Broccolini is high in vitamin C and contains significant vitamin A and dietary fibers. One cupoz) contains 37 calories with 105 percent of daily vitamin C intake, 39 percent of vitamin A needs and 15 percent of dietary fiber needs. Broccolini also contains potassium, calcium, and iron in small amounts. We also stir fry Broccolini with garlic. Rapini, commonly marketed in the United States as broccoli raab or broccoli rabe /rɑːb/, is a green cruciferous vegetable. The edible parts are the leaves, buds, and stems. The buds somewhat resemble broccoli, but do not form a large head. Rapini is known for its slightly bitter taste, and is particularly associated with Italian and Portuguese cuisines. The young leaves of these plants used in cooking are either the same as or the South European equivalent of turnip tops or turnip greens. The flavor of rapini has been described as nutty, bitter, and pungent. 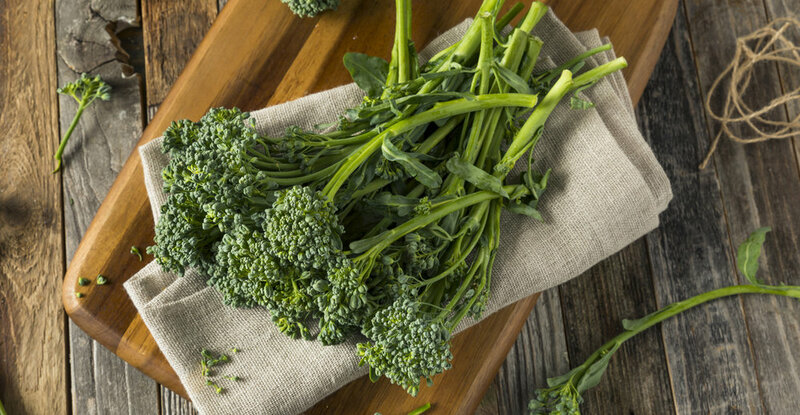 Like Broccoli and Broccolini, Rapini is a source of vitamin A, C and K as well as potassium, calcium and iron. One common method of preparation includes boiling the rapini in boiling saltwater before sautéing in olive oil with garlic and chili pepper. 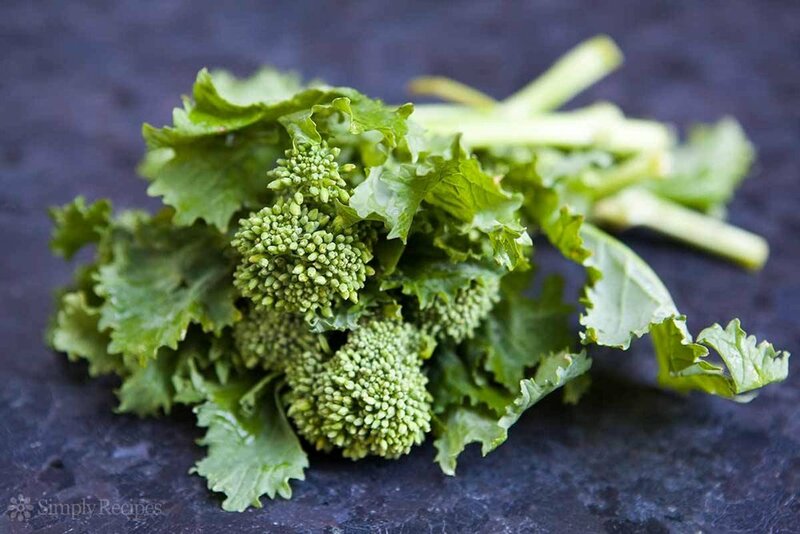 Blanching is a common first step for preparation, after which rapini may be cooked in various ways, including sautéing, grilling, or roasting. We, of course, stir fry with garlic. Whatever your choice from this diverse family of vegetables, enjoy one serving this week.